Tom Jones came full circle with this album - from the tuneful sixties pop of the mid-sixties, to the semi-country ballads of the late sixties/early seventies, to the Las Vegas residency years of the mid seventies and then the collaborations with contemporary dance/chart acts in the nineties - Jones had showed his versatility in coping with all those styles effortlessly. Here, joining up with boogie-woogie pianist Jools Holland, he revisits his first love - rocking blues/r 'n' b. The album is a revelation. Both of them seem to be having an absolute blast and Jones sounds as invigorated as he ever has, showing just what a great, strong blues voice he has. The album has an "almost live" feel about it, giving the impression from the first "ready Tom" shout that they just turned up to the studio and laid it down in one take. The album also features some seriously kick posterior brass sections too. It goes without saying that Holland's piano is rocking throughout. "How's that?" Jones asks in his deep Welsh baritone after the opener, "Life's Too Short" finishes its frenetic few minutes. It was fine, Tom, and you know it too. "200 Lbs Of Heavenly Joy" is a blues burner of high quality, packed full of searing slide guitar and Jones' voice soaring high above the whole thing, as if he were born to it. There are nineteen tracks on the album, just listening to the first couple makes you realise that it has something special about it. You don't actually need to listen to the whole lot, just put a few on before going out and it will lift your mood. Again, it is pretty superfluous of me to describe each track, as they are all great and delivered by musicians of the highest order. 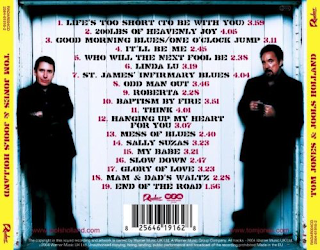 "Good Morning Blues"; the frenetic blues rock of "Linda Lu"; the totally effervescent, addictive "Sally Suzas" and the New Orleans jazz-flavoured "St. James' Infirmary Blues" are among my favourites. This is just a seriously enjoyable, good time album. Highly recommended. There is an argument that suggests this was Tom Jones' best ever album. There may be something in that.